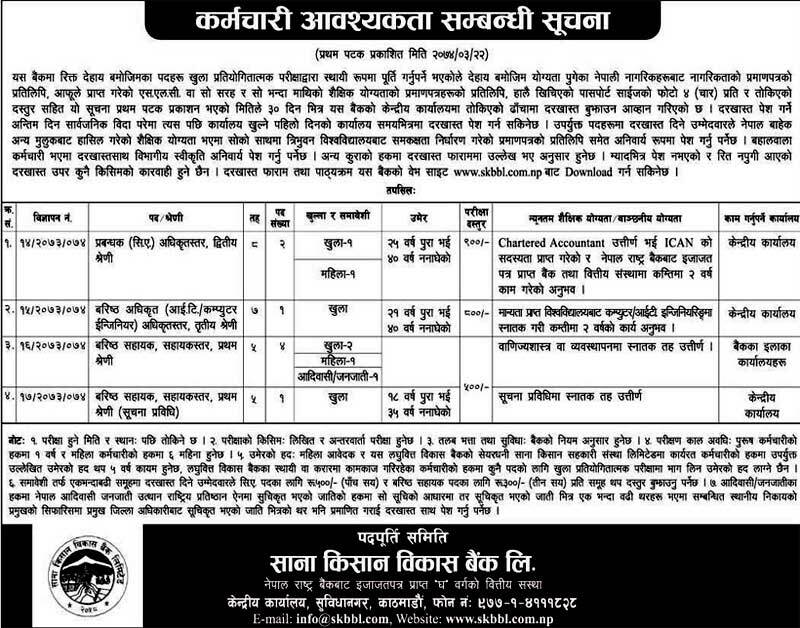 Applicant should be a Nepali citizen, should not be more than 50 years on March 14, 2018, should hold Masters’ Degree in Management/Economics/Commerce/Business Administration, or Bachelor in Management/ Economics/Commerce/Business Administration/Law/Sociology with at least 5 years of experience in SKBBL/Small Farmer Agricultural Cooperatives Limited (SFACL), or Intermediate in Commerce/Economics/Sociology/Law or equivalent and at least 10 years of experience in SKBBL/SFACL; should have valid motorcycle driving license. S/he should have knowledge in basic computer and be a team player. Preference will be given to the candidate with prior experience in SFACL Replication. The Business Development Officer shall be based in Area Office Butwal and Nepalgunj, with at least fifty percent travel in the program districts (Gulmi, Arghakhanchi, Salyan, Pyuthan, Rukum East, Rukum West, and Rolpa) to accomplish the tasks as mentioned in the ToR. Applicant should submit a Covering Letter, updated Curriculum Vitae in specified format, self-certified copies of work experience, academic (highest obtained) and citizenship certificate in a closed envelop to the following address within 15 days of the first publication date of this notice. Last date to apply: 11th April 2018. The Terms of Reference (ToR) and Standard CV format can be obtained from the Central Office of SKBBL or can be downloaded from the following link: www.skbbl.com.np. Only shortlisted candidates will be contacted for further process. The Bank reserves the right to accept or reject any or all applications without assigning any reasons whatsoever. Canvasing of candidate at any stage is strictly prohibited.